I have plans. The plans are to make Jacques Pepin's Quiche. His recipe is called "Quiche with Bacon" and uses Gruyere or Emmenthal. I swear I saw him make this dish on one of his TV shows where he used ham and Jarlsberg. I've got the ham and Jarlsberg and fingers crossed. I may or may not make salad. After getting two future meals going today I'm a little cooked out. Not giving in to take-out, though, unless the quiche is an abysmal failure...which it will not be! What's winning your taste buds over for supper tonight? Tasso pasta, which is our homemade tasso ham, carrots, onions, garlic, and zucchini and yellow squash in a cream and chicken broth sauce with a handful of grated parm thrown in at the very last, then served over pasta. Don't need any spices or herbs, there's more than enough spice from the tasso. Roasted cauliflower cheese soup. I cleaned out the vegetable drawer and threw in some celery leaves and romaine. Leftover chicken nuggets with honey mustard dip. Pan roasted chicken thighs, rice pilaf (for me) and a veggie. B/S chicken thighs in the slow cooker, in mild salsa with cinnamon, cumin, and dried cherries. Served over couscous, spinach salad on the side. It was an absolutely gorgeous day out today, so Mister K~girl and I went out to run some errands. Along the way, he announced, "I'm hungry, let's go have some lunch somewhere, you pick." WHAT?! Sure thing buddy ... so I vetoed Five Guys Burgers and Fries and we went to one of my favorite soup/salad/sandwich places that's a chain in Arizona only. WOW! They are very generous with the food. I ordered a half sandwich and petite salad combo and DH had a full Ham&Cheese on Rye with chips. We couldn't finish either plate, it was so much. We'll finish up our sandwiches and I'll add some sort of side to them. We planned to have a bite out but got lazy..
Breakfast for dinner.. Scrambled eggs with sriracha, green onions and diced green chili's added.. Hash browns, bacon and toast.. Easy and very little mess... Chocolate cake for dessert..
... on your brand new covered cake plate! We had Thai Chicken Thighs tonight. 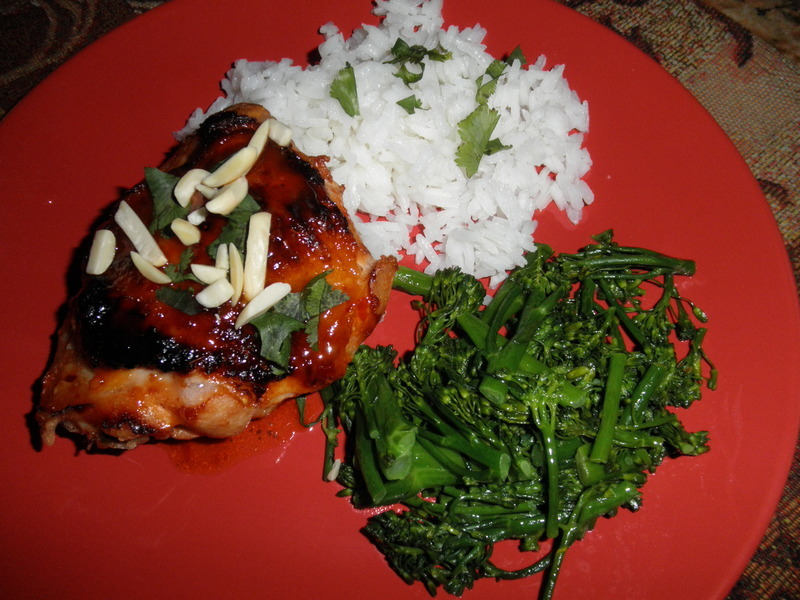 I've used the recipe several times and it's sticky delicious with some jasmine rice for the sauce, and steamed broccolini on the side. I don't like peanuts, so I used slivered almonds. Here's the recipe, and it's a keeper. I used TJ's brand of sweet chili sauce. I had a doctor's appointment this afternoon and class tonight, so we just snacked. I made a plate of nachos for me while DH was out for a run. No idea what he ate, but there were lots of leftovers in the fridge.